Reading all of the silly mistakes and what had a strong influence on me when I wrote it is cringe worthy. I cannot wait to rewrite the first and second chapter. The first chapter could use a lot of work and I did not like it as much as I like chapter two. When I wrote the two chapters, there was a large time period between. I could tell that there had been some growth in my writing, which is good, no writer wants their writing to plateau. I decided when I was still taking classes, that I should get a notebook and dedicate it only to my first novel and if the notebook permits the continuation of the book one after that. The notebook I have is small, containing 80 pages, but it will suit me until I fill every page front and back. There was something that I started to do, just to keep my thoughts and ideas organized. I sectioned off parts on a page, wrote the chapter name, characters that were going to be introduced or mentioned and the three main focuses of the chapter. 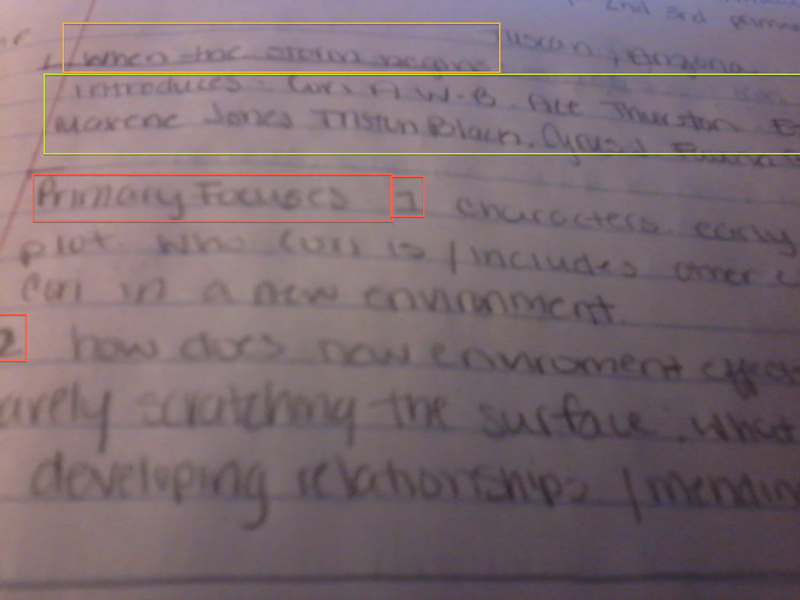 Limiting the amount of space I have makes sure I am not going into a chapter outline in detail. Eventually I will go into detail of the chapters. The focus section is the most important information for a reader and everything else will fall around it. Hopefully. I also leave line for extra notes, in case I need add something, so I won’t forget it. I also use it as a back up of what is on my computer. The only thing is that I have make sure both are on the same page- no pun intended. I have multiple notebooks around my place that has all the information that I need it in. The notebook thing started because of my cousin, who wanted to help me set up a writing portfolio. Needless to say it didn’t happen, but I began using it as an outlet for ideas. The first notebook is mostly full, every page. I have extra papers sticking out of it. I think each writer should have several notebooks, one for general and ones for each of their stories. In them should at least contain a name bank (first and last) with meanings and origins. And have tab dividers. I wish I am more organized but it’s getting there. One notebook at a time. Posted in Writing and tagged book, bored, chapter outline, characters, fiction, focus section, notebook, notebooks, novel, write, writers, writing. Bookmark the permalink. Even in this digital age, with helpful apps, I find this my most productive tool to set the stage for my ideas…..Great Post….